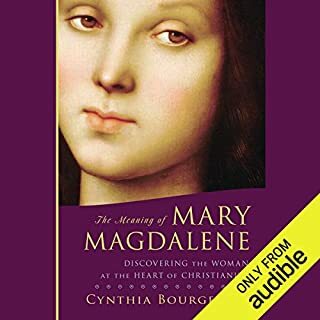 Where does The Meaning of Mary Magdalene rank among all the audiobooks you’ve listened to so far? I can honestly say it is at the top of the list. It was written by someone who has lived, studied and contemplated the topic for many, many years. The idea of the church being formed by "male, celibate monastics" caused a major shift in my perspective. This combination resonated with me as a major cause of movement away from the Beginning Church. I have celebrated the Mass for many years and today, it was different for me; it was different as a result of Cynthia's presentation of what "This is my Body" means. I am forever changed and eternally grateful....and I get it! This book is for those who are open to a new way of looking at Christ, women, Mary M and the Church. If you're a conservative Roman Catholic or Evangelical, I suspect you won't like her or this book unless the Holy Spirit is drawing you into a deeper love relationship with God. I caution the reader, though. Hold onto your hat. She will say things that might shake you up; she may say things that might upset you. But hang in there. LISTEN to what she says, take it in, pray about it. I confess I was ready, at one point, to put the book down and not pick it up. Truly. But today, after the 2nd reading of it, I deeply sense she is a modern day prophet worthy of your time to read or listen to what she has to say. Despite the papacy's enormous influence, how much do you really know about this ancient and powerful institution? Catholics and non-Catholics alike will enjoy these 24 illuminating lectures about this remarkable institution. 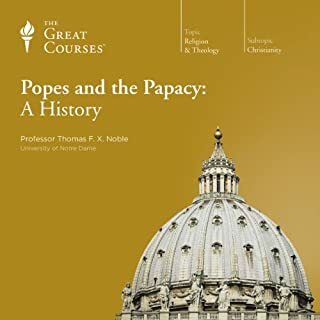 Professor Noble gives you priceless insights into the dramatic history of the papal office and the lives of the men who represented it. Filled with interesting stories and remarkable insights, this course promises to educate, enlighten, and entertain you. Yes. It offered a good history of the Papacy with an incredible amount of detail on many of the Popes. It also engaged the listener in areas of theology and church history. A great presentation by an enthusiastic teacher. 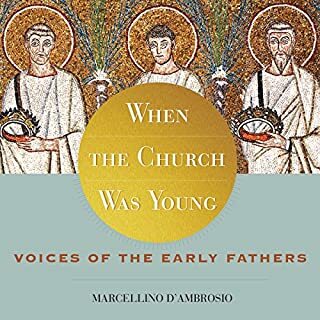 I was hoping for a neutral, scholarly perspective and was encouraged in the beginning when he raised the fact that there are questions of whether or not Peter was ever in Rome, let alone be its first bishop. But he seemed to become more and more of a "company man" as the teaching progressed. He kind of lost me when he tried to suggest that the Roman Catholic Church was not wealthy. He even suggested that the artwork was nothing the church would ever sell. I wanted to talk back to him and ask him one question: "What about all the real estate it owns around the world?" But don't let that deter you from listening to him. He does a great job even if his bias becomes very clear as time goes on in his teaching. 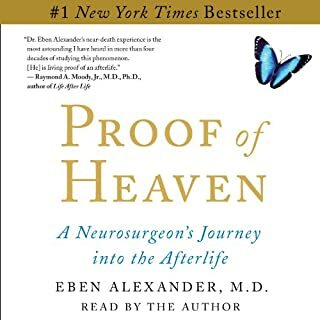 On November 10, 2008, Dr. Eben Alexander was driven into coma by a disease so lethal that only 1 in 10,000,000 survive. Seven days later, he awakened with memories of a fantastic odyssey deep into another realm that were more real than this earthly one - memories that included meeting a deceased birth sister he had never known existed. Dr. Alexander deployed all his knowledge as a scientist to find out whether his mind could have played a trick on him. In its shutdown state, there was no way it could have. What did you love best about Proof of Heaven? Dr. Alexander's desire to share his most intimate thoughts about his life experiences. What was one of the most memorable moments of Proof of Heaven? When he spoke of the realization that it was his sister who spoke to him from the wings of a butterfly. Have you listened to any of Eben Alexander’s other performances before? How does this one compare? Throughout the book Dr. Alexander communicated a sense of mission and purpose; to share his near death experience with others so that they might find hope in this life and love in the afterlife. 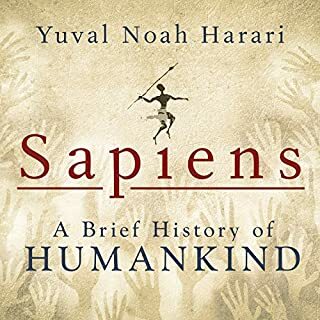 What disappointed you about Sapiens? I sense the author has a "bone to pick" with people of faith. At least that's how he came across to me. His approach is scholarly to the extent of the research. He lost me when he went out of his way to belittle people of faith and their practices as though they are at some base existence. It's one thing to be theistic. It's another thing to be atheistic. I can understand both positions. But this author comes across as anti-theistic. It is this anti-theistic presentation that robs the book of being a scholarly work. All of us view our world with our perspective. I believe the scholarly approach would have been for him to own this perspective and presented the research without the snide commentary. Derek Perkins did a beautiful job in reading the book. Most enjoyable voice. My three questions are this: 1. Why did the author go out of his way to ridicule a god, that in his own mind, does not exist? 2. Where did matter, (the elements) come from? 3. And if matter did not come from a creator, then can you prove your belief with scientific evidence or are you stuck, like the rest of us humans, having to accept certain things in life, on faith? 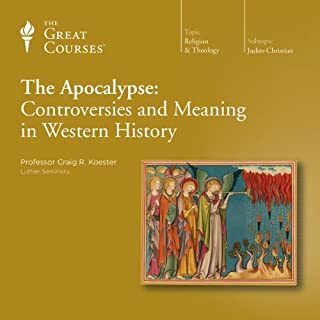 What did you love best about The Apocalypse: Controversies and Meaning in Western History? Looking at Revelation from a literary perspective brought new understanding for me. Have you listened to any of Professor Craig R. Koester’s other performances before? How does this one compare? I wish the professor had more teachings available. I thoroughly appreciated his academic approach, presenting his understanding as well as other perspectives. The book of Revelation is not about the future, rather a classic writing that speaks to people of any time and culture. I couldn't help thinking that the U.S. today is very much like the imperialistic Roman Empire at the time Revelation was written. We are also a culture that embraces power and violence; which caused me to wonder if my country, the United States of America, isn't the "Whore of Babylon." I love his teaching and he doesn't give you much room to think outside of his Franciscan box. There's almost an arrogance about his perspective which left me feeling diminished and underdeveloped because I did not always agree with his assumptions. I grew weary of hearing the term "tribal", feeling more like a judgement than a description when it did not line up with his perspective. With that said he brings a powerful message of hope and love and redemption for all. Would you try another book from Marcellino D'Ambrosio and/or Marcellino D'Ambrosio? What about Marcellino D'Ambrosio’s performance did you like? He was enthusiastic about his topic and well informed. I found myself talking back to the author when he would state his opinion as fact. It lacked a scholarly approach that would have presented other opinions and/or perspectives. If you want to understand the justification for Roman Catholic dogma, this is an excellent representation. I just got bored with his perspective after awhile. Sad. It had some good content. What did you love best about Falling Upward? I sense it is an inspired writing about how to live out the second half of our life with an open heart and mind; to live with joy, gratitude and graciousness. 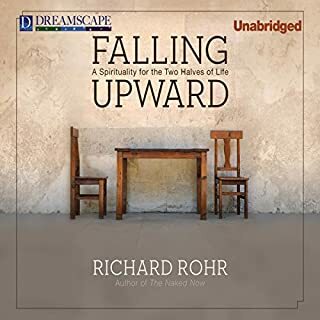 In the book, Rohr confronted some of my first half of life thinking and gave me an explanation about what I am experiencing today. It has made me even more grateful for my life and where I am today in this aging process. I recommend it for anyone over 40 (I wish I would have read it then). I do not recommend it for those who are still entrenched in their first half of life thinking where there is an absence of curiosity and the presence of absolute certainty....about anything. 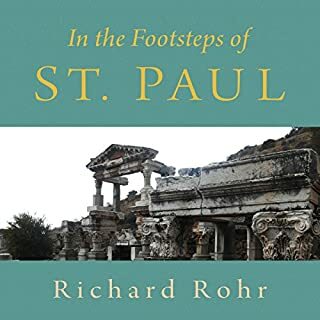 It may take a second "reading" before Rohr's teachings can be full absorbed and appreciated. Yes, with caution about their practice of eisegesis. 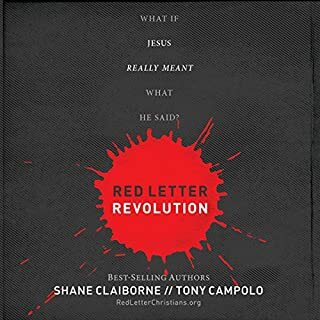 What other book might you compare Red Letter Revolution to and why? It is quite unique although it follows much of what the emerging church espouses. Have you listened to any of Stu Gray and Chip Arnold ’s other performances before? How does this one compare? Claiborne and Campolo work well together. I personally believe their views of the church today and their response is where Christianity needs to move. With that said, it drove me nuts listening to them quote book, chapter and verse almost every minute to prove their point. The very thing they criticize of other Christians, they do themselves. Had they presented their ideas (based upon their understanding of the Scriptures) without the eisegesis, it might have made them more credible biblical scholars. So, if you can get past this, their ideas and practices are, in my opinion, spot-on for the Church today.